Earlier this week, the Indian press reported that 20,000 NGOs had been cancelled by Prime Minister Modi’s crusade against corruption. According to those reports, only 13,000 NGOs remain as approved by the government. It is unclear if any of the NGOs connected to mission giant Gospel for Asia has been caught up in the crack down. The government’s Home Ministry website provides lists of about 12,000 NGOs which are not now approved and none of the GFA organizations are listed. However, given the reports of 20,000 cancelled, presumably more will be announced in the days ahead. 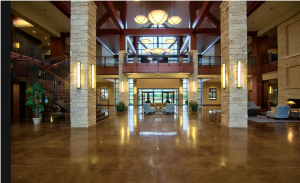 In looking for information about the drastic measures, I learned that Gospel for Asia in India is now called Ayana Charitable Trust (see this blog post at India Happenings). To my knowledge, this name change was not disclosed to donors outside of India. The Gospel for Asia – India website is not functional and hasn’t been for months. Apparently, donations from America, Canada and around the world are being sent to Believers’ Church as well as a handful of NGOs in India, all affiliated with Believers’ Church. Apparently, Gospel for Asia isn’t operating as GFA in India. Recent government filings indicate no foreign contributions to Ayana Charitable Trust. For instance, look at this report filed in the last quarter of FY 2015-2016. However, in April 2016 the Deccan Chronicle reported robust contributions for 2014-2015 to Ayana Charitable Trust, Believers’ Church, Love India Ministry and Last Hour Ministry, all affiliated with Believers’ Church. This reflects donations from GFA in Wills Point, TX to these NGOs. The Chronicle reported the donations to Ayana and not the old name of Gospel for Asia. However, as noted above, Ayana reported no contributions in the last quarter of FY 2015-2016. It is unclear why GFA has changed the name in India. Creating multiple NGOs and changing their names does make it harder to track donations. Given the intense scrutiny of GFA’s activities (leading to expulsion from the Evangelical Council for Financial Accountability), making it hard to track activities might be a defensive strategy. Here I list the ten most visited posts of 2016. As you will see, this list doesn’t correspond to the top stories of the year. The American College of Pediatricians versus the American Academy of Pediatrics: Who leads and who follows? – This 2011 post became popular again as a means of demonstrating that the ACP is a fringe group compared to the AAP. It shouldn’t be a surprise that I wrote this post to debunk a David Barton claim. 2. Open Letter to Gateway Pastor Robert Morris From a Former Member of Mars Hill Church – This 2014 post has been popular since it was published. When Robert Morris downplayed Mark Driscoll’s offenses at Mars Hill Church, he offended many former attenders of the church including the articulate author of this post. 3. NewSpring Church Won’t Deny Departure of Perry Noble (UPDATED – Noble Dismissed July 1) – After days of speculation, megachurch New Spring Church announced the departure of founding pastor Perry Noble during their regular Sunday morning worship service. Noble acknowledged alcohol abuse and said he would go into a counseling program. 4. Tullian Tchividjian Out at Willow Creek Presbyterian; Majority of Liberate Network Board Members Quit (UPDATED) – Tchividjian’s fall has continued to reverberate. Most recently, he was accused of multiple extramarital relationships and censured by an organization that has his brother and uncle as board members. His publisher David C. Cook is sticking with him. 5. Glenn Beck on Why Ted Cruz Will Win: We Have Almighty God on Our Side – Election 2016 overshadowed everything – real news, sanity, theology, etc. Although Beck is singing a different tune now, he was all in for Ted Cruz during the primaries, saying that God was on his side. Apparently, even God had to acquiesce to the Trump train. 6. Darrin Patrick Has Been Relieved of Pastoral Duties at The Journey – It was a hard year for megachurch pastors. 7. Former Chief Financial Officer at Turning Point Claims David Jeremiah Used Questionable Methods to Secure a Spot on Best Seller Lists – David Jeremiah largely dodged the scrutiny Mark Driscoll received over using deception to prop up their books. However, this post continues to attract reader attention. Jeremiah’s last couple of books haven’t made the best seller lists so he may have quietly put aside the schemes. 8. Mark Driscoll Announces Launch of The Trinity Church (UPDATED) – Rumored since early 2015, Driscoll finally started a church in Phoenix. Displaying his flair for the dramatic, Driscoll’s congregation went on the hook for a mid-century modern building which once housed a drive in church. 9. RICO Lawsuit Filed Against Former Leaders of Mars Hill Church; ECFA Named As Co-Conspirator – Although later dismissed, this lawsuit alleged mishandling of funds at Mars Hill Church, specifically naming Sutton Turner and Mark Driscoll. 10. A Major Study of Child Abuse and Homosexuality Revisited – This 2009 post has appeared before in my top ten lists. This study is often used by those who want to stigmatize LGB people. However, an error in the study report renders it nearly useless for scientific purposes. Thanks for reading and I hope 2017 is full of blessings. After 2016, we need a breather. Rejoice! Messiah, Thy Name is Trump! We all knew that Donald Trump thought highly of himself. Now on the day after Christmas, we learn that Trump is responsible for dispelling the gloom and bringing hope to the World. The world was gloomy before I won – there was no hope. Now the market is up nearly 10% and Christmas spending is over a trillion dollars! That we may Thy salvation see. Thy tender healing grace bestow. That perhaps is the most frightening tweet yet. Author Warren ThrockmortonPosted on December 27, 2016 Categories UncategorizedLeave a comment on Rejoice! Messiah, Thy Name is Trump! 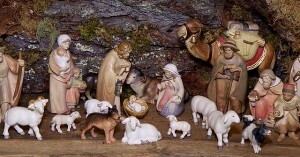 One Player Plays O Come, O Come Emmanuel on Two Recorders – Merry Christmas! Once again, a wonderful performance. Recorder artist Victoria Rigel plays two recorders at once in this 2008 version of O Come, O Come Emmanuel with yours truly on the guitar. She adds the second recorder at the beginning of the second verse. Author Warren ThrockmortonPosted on December 25, 2016 Categories Holidays, MusicTags Christmas 2016, o come o come emmanuel, victoria rigelLeave a comment on One Player Plays O Come, O Come Emmanuel on Two Recorders – Merry Christmas! Lance Wallnau has been a supporter of Donald Trump for a long time. He promoted his rise as a modern day King Cyrus and said God directed him to support Trump. Wallnau is also a key and early promoter of Seven Mountains Dominionism, the view that Christians need to take dominion over education, religion, politics, the arts, business, media, and family policy as a part of expanding God’s Kingdom. Wallnau sees Trump’s rise as a means of bringing the mandate to take dominion to fruition. With a straight face, Wallnau posted a video to his 7MUnderground Facebook page apologizing for not asking his followers for money. The 7M Underground appears to be Wallnau’s latest effort to cash in on dominionist support for Trump. Political and religious observers should not underestimate the boost Trump’s victory has given the 7M dominionists. From their point of view, God hand picked Trump to help them enact the dominion of 7M Christians over America. They no doubt feel vindicated and may be even more inclined to see their political opponents as opposing God’s will. Wallnau has a doctorate from diploma mill Phoenix University of Theology, a school where you pay by the degree and don’t take classes. Last year on Christmas day, I posted audio of Audible Waters, a music project involving frequent commenter R. Jesperson. Recently, AW put together a clever video of their version of We Three Kings. Enjoy and Merry Christmas! WAY-FM’s pledge drive is over. I assume they reached their quota of Feed the Hungry pledges ($100) because the ad has now been removed from the front page of the website. Last week, I wrote critically about WAY-FM’s claim that a $100 donation to the station helped a child in South Sudan have food for a month. As far as I can determine, the children will get food no matter what WAY-FM donors do. After I published my response to the Feed the Hungry radio promotion, I was contacted by an individual who did not want to named but who challenged my understanding of the facts. This person said that a donor at Feed the Hungry donated sufficient money to cover the promise of a month of food for each donation of $100 to WAY-FM for 1000 kids. * However, if WAY-FM listeners did not come through, the Feed the Hungry donor was under no obligation to donate the full amount (about $6000). Thus, if 900 donors gave $100, then the Feed the Hungry donor would only give $5400. To me, I don’t know which is more troubling. WAY-FM promising something that isn’t happening, or a donor holding food hostage unless American Christians give $100 to a radio station. Whether it is K-LOVE and a warm coat or WAY-FM and a month of food, I question this means of raising funds. Using cold and hungry children as bait to raise money is disturbing. I would like to see this end as a fund raising practice. Do cross promotion, but don’t make aid to a child contingent on guilt and manipulation. Thus far, when I have asked questions about whether or not there is a real donor behind either coats or food for a month, I get silence from K-LOVE, Operation Warm, WAY-FM and Feed the Hungry. Sometimes when the programs are described, the language gets tortured and odd. For instance according to this WAY-FM description, the food is given in the “honor” of the WAY-FM donor. Thanks for your special investment to ensure WAY-FM’s critical year-end funding need is met. And with every $100 you invest in WAY-FM, ministry partner Feed The Hungry will provide a month of food this Christmas season to a child fleeing war-torn South Sudan. Multiples of $100 count too. Your gift of $200 feeds 2 refugee children, and your $500 covers 5 children. 100% of your investment stays with WAY-FM, as Feed The Hungry makes these meals possible in your honor! How does giving to a radio station warrant a donor being honored for what Feed the Hungry does? Somehow I get to feel special for what someone does? This language is very similar to the K-LOVE/Operation Warm coat promo. Operation Warm’s spokesman told me the coats are given to cold kids in honor of K-LOVE donors who give $40/month. Donors will have to speak up. I have raised these concerns to both K-LOVE and WAY-FM and they have done nothing. Apparently, it works too well. Christian music artists haven’t spoken up as far as I can tell but they should. I have spoken to several industry insiders who acknowledge the scandalous deception but are afraid to speak up because of the market power of the big three networks. To say something would compromise their livelihood. I get that. In addition to voting with our dollars, donors are going to have to speak out for this to change. And donors should stop making contingent challenges. ** Just give cheerfully and let your yes be yes. Still not convinced? Here is another suggestion for those who want to support a radio station and give money to the needy. Let’s take WAY-FM and Feed the Hungry as an example. You could give $40 to WAY-FM and $60 to Feed the Hungry. You would be helping the station and feeding 10 hungry kids for a month. See how that works? Personally, I don’t like the deception so I give elsewhere. However, if you aren’t convinced these groups being deceptive, consider another way. Radio executives might have to take a pay freeze but more coats and food will be given. 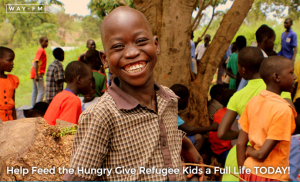 There’s still time to help reach your WAY-FM’s $100,000 Pledge Drive Launch Goal and realize the dream of feeding 1,000 hungry refugee kids this Christmas season. Your gift by midnight tonight will help give your WAY-FM a solid start to the Year-End Pledge Drive – so that together, we can impact even more people who desperately need the hope of Jesus in 2017! And remember, with your investment of $100 or more, WAY-FM’s ministry partner, Feed The Hungry, will provide a month’s worth of lifesaving meals to a child fleeing war-torn South Sudan. So I’m praying you’ll invest generously now to encourage listeners and help feed 1,000 hungry kids this Christmas season! **I do think challenging groups to participate is fine, e.g., I gave $100, now I challenge all guitar players to give at least $100 to the food bank. According to this WAY-FM description, the food is given in “the honor” of the WAY-FM donor. Professor Watchlist: Please Pick Me! 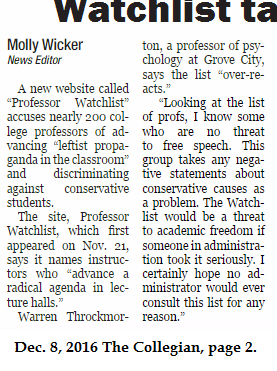 Recently, Turning Point, a so-far-to-the-right-you-can’t-see-them-from-here group, created a list of “liberal” (words really have no meaning now) professors who are supposedly a threat to free speech for conservatives on campus. When I looked on the list I found Matthew Boedy, a guest contributor to my blog. Matthew’s liberal offense? He doesn’t want guns on the campus of the University of North Georgia. Dr. Matthew Boedy, a professor at University of North Georgia, believes that universities would be more dangerous if they had students legally carrying firearms. Boedy spoke out against a new bill which allows for concealed carry on campus, claiming that he feared he would be shot by disgruntled students if concealed carry was legal at the university. Sign me up. I’m not a big fan of concealed carry on campus either. The founding board of Thomas Jefferson’s University of Virginia didn’t like the idea either. Matthew, how did you make it and I didn’t!? I was asked about this by a reporter at Grove City College’s student paper, The Collegian. My thoughts last week. Jonathan Zasloff is on the list because he pointed out that the GOP catered to the KKK’s core of angry white men. Well, the KKK and other white supremacist groups endorsed Trump and Trump gave press credentials to white supremacist James Edwards. To be sure, some are far left (e.g., Mark Tushnet), but some are moderate or even lean right. They just happened to get on Turning Point’s bad side. I see two major audiences for this nonsense. One is prospective students and their parents. I do think it is important to warn prospective students that even conservative academics reject this stigmatization of free speech and academic freedom. Another group is administrators of conservative colleges who might use this somehow in hiring and firing. Such a use would be a tragedy and I hope academics of all stripes would come together in opposition. Author Warren ThrockmortonPosted on December 17, 2016 Categories educationTags Professor Watchlist, Turning PointLeave a comment on Professor Watchlist: Please Pick Me! WAY-FM: Gospel for Asia "Passed Our Internal Review"
Looking around on Christian radio network WAY-FM’s website, I saw this ad for Gospel for Asia. First, GFA isn’t really giving very many animals to children. Most goat gifts end up in a fund which may or may not provide an actual animal to a family. Then, I wondered if perhaps WAY-FM was unaware of GFA’s ethics and legal problems. Even K-LOVE told me at one point they no longer partner with GFA. I wrote WAY-FM to find out. The response led to another question which has yet to be answered. All Impact Partners are internally reviewed prior to airing and GFA passed our internal review once again. So an advertiser is an “impact partner” and GFA passed an internal review. This response led to my next, as yet unanswered, question. What would GFA have to do in order to fail? Apparently, an impact partner can be evicted from the Evangelical Council for Financial Accountability due to multiple violations of financial integrity standards and still pass. An impact partner can be removed from the Combined Federal Campaign by the U.S. Office of Personnel Management due to violations of federal regulations and still pass. An impact partner can be disgraced in an Indian court for misusing donor funds and still pass. An impact partner can be removed from the Independent Charities of America and still pass. An impact partner can be removed from membership in the National Religious Broadcasters and still pass. An impact partner can fail to make available audited financial statements for 2014 and 2015 and still pass. An impact partner can commit all those misdeeds and leave the same leadership team in place and still pass. I would like to know what groups fail WAY-FM’s internal review. I could do a lot of blog posts on that group. Author Warren ThrockmortonPosted on December 16, 2016 Categories David Carroll, ECFA, Gospel for Asia, K.P. Yohannan, WAY-FMTags Gospel for Asia, K.P. Yohannan, WAY-FMLeave a comment on WAY-FM: Gospel for Asia "Passed Our Internal Review"
It’s the perfect time to partner with Feed the Hungry for WAY-FM’s Year-End Pledge Drive. Every gift of $100 not only keeps the ministry of WAY-FM going, but also provides a month of hot meals to these refugee kids – just in time for the Christmas season! Just in time for the Christmas season, I wrote to WAY-FM and then called the donor phone number to ask how my $100 could keep WAY-FM on the air and feed a hungry refugee child for a month. After my second attempt, a wonderful young woman told me that WAY-FM is partnering with Feed the Hungry and that Feed the Hungry’s food would be “unlocked” by my donation. She assured me that 100% of the $100 would stay with WAY-FM to keep them on the air. She told me they call it “unlocking a door” when a listener donated the requisite funds. All I could envision was a bunch of locked rooms with food inside and hungry children outside waiting for an American Christian to send $100 to WAY-FM. A month of food held hostage waiting for the $100 ransom. Later I learned that this arrangement between WAY-FM and Feed the Hungry is similar to K-LOVE’s and Operation Warm’s coat donor illusion. In an email, a representative from WAY-FM very candidly explained that Feed the Hungry wasn’t withholding food while waiting for WAY-FM donors to give $100. I was informed that the partnership was about mutual benefit and that Feed the Hungry just wanted WAY-FM listeners to feel a part of it. One moral of the story is: If you want to help hungry kids or provide a warm coat, don’t give a donation to a radio station. I would probably give to a station like that. I think a lot of people would because they would just want to reward the honesty — just in time for the Christmas season when we celebrate the birth of the guy we are supposed to be imitating.